I know there are some of you who are still living in the past but here in France we are now in 2016, so I wish all of you and your families good health and a great and prosperous new year! Happy New Year, everyone! Looking forward to hanging with you here at Skullknight.net for more Berserky goodness this year! Happy New Year!!! Wishing you all the best in 2017! I'm very excited to see what Miura has in store for Berserk this year. Thanks JMP, Happy New Year to you as well! Let's hope 2017 holds better things for us than 2016 did. Hehe, episode 352's timing was fortuitous. 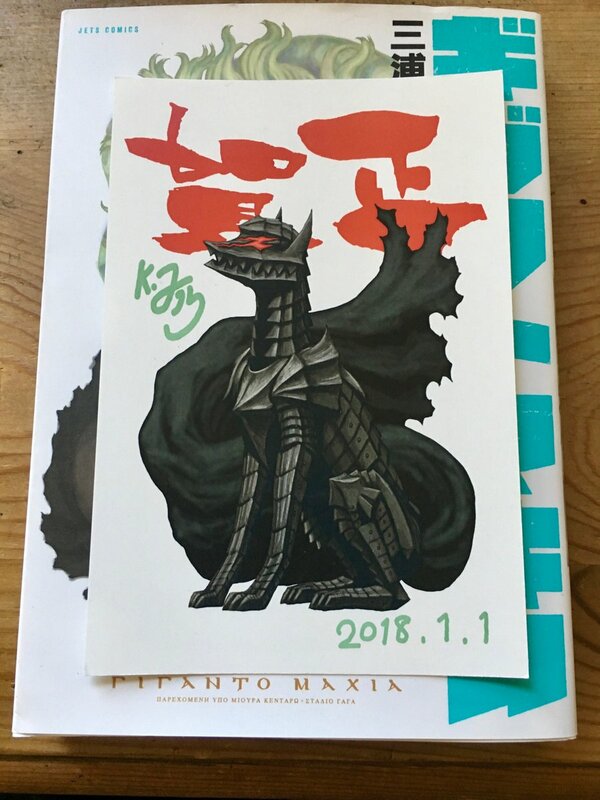 It's perfect for the Year of the Dog! Probably a great start into 2018 for him! Happy New Year! I really enjoy this community of folks and I wish you all peace, joy, and prosperity in the coming year. Yeah, I was thinking about that, too. Pretty cool. Cool postcard illustration, thanks for sharing Kaladin. Thanks, happy new year to you and everyone at SK.net. Thanks! I wish you all a very happy new year! Happy 2019 to all! I hope everyone meets their ambitions for the new year. I'm personally hoping to draw more!